Leeds United head coach Thomas Christiansen pleased with the result at Barnsley. Picture: James Hardisty. Leeds United boss Thomas Christiansen believes his players have regained their confidence ahead of another big night at Elland Road when they face promotion big-hitters Aston Villa on Friday. The Whites did crash 4-1 to leaders Wolves last Wednesday, but wins either side of that match in contests against Middlesbrough and Barnsley that had plenty riding on them have eased the pressure on head coach Christiansen and at the same time got fans looking upwards again. Another win on Friday can see Leeds close to the play-off places once more and Christiansen is expecting further progression from his team after seeing them win for the only the third time in their last 19 visits to Barnsley’s Oakwell ground. With eight defeats in their previous 10 games this season a visit to Oakwell was certainly not the easiest of prospects. 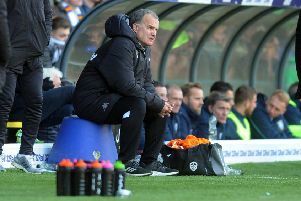 But Leeds produced one of their best all-round displays under the current boss as they defended well and fought for the right to play some of the attacking football they are capable of with Samuel Saiz scoring his ninth goal of the campaign and Ezgjan Alioski netting for the fourth successive game. “For me it is another three points, for the players it is important to build on the confidence,” Christiansen said. “The team is back, we are hoping the results will improve now. “I am very pleased for the players to take three points. “We had two very difficult games against teams who have been in the Premier League (Middlesbrough and Wolves) and then a derby where we have not done well in the past. It has been a very good week. Christiansen was delighted with the manner of the performance. He added: “I believe that the players went out with the right mentality and that is the only way we could take something positive from here. “We knew how difficult it would be to take something positive away from Oakwell, because over the last 18 years, Leeds have only won twice here. “That was a sign for the players to go out on the pitch and focus on what they had to do. “We controlled the match throughout the 90 minutes, we produced a strong defensive game and up front we put away the opportunities we had. “We came out straight away and tried to put them under pressure, because we felt we could have many opportunities with the second balls. Another tough test awaits United with Villa next up and looking like the real deal after a difficult couple of years. After their 2-0 win over Ipswich last weekend they were up to fourth place in the Sky Bet Championship and they come to Elland Road with three straight victories behind them. Manager Steve Bruce knows all about what it takes to get promotion from this division, although he admitted to being impressed with Leeds when he watched the game at Barnsley. He said: “Leeds have got some good players up the top end of the pitch. We’ll have to defend well.